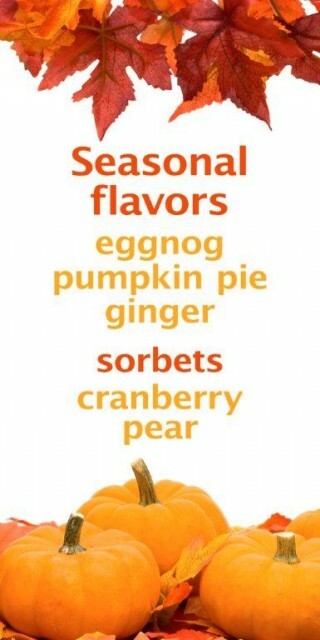 BlogHome » Fall Mora Ice Cream Flavors Have Arrived! Pear Sorbet: This fresh sorbet tastes just like biting into a juicy, crisp pear! Every pear is hand-peeled and cored at our local factory. We suggest trying it on mulled wine and serving it before dinner. Eggnog: Picture yourself sitting in front of the fireplace on a snowy winter night about to enjoy the heavenly flavor of our eggnog ice cream for a perfect way to start your holiday season. Pumpkin Pie: All the spices flourish in this flavor which brings back memories of traditional Holiday celebrations. Ginger: This sophisticated and refreshing flavor is make with both grated fresh ginger and candied ginger. It is especially good served with spice cake. Cranberry Sorbet: Intense colorful sorbet made with fresh cranberry. This flavor goes well with dark chocolate ice cream or a simple dollop of whipped cream.